The new moon was this past Friday. When I remember, I like to do a little something for the new moon. I worked late on Friday so I didn’t really work on my manifestations until Saturday. There was a new moon ritual in Orlando on Saturday night. I planned on going to it. It was the same place that held the Lughnasadh Ritual I attended. The rituals are always pot lock and last time I went I didn’t have time to make anything and just took Publix potato salad. This time I wanted to actually make something. I decided to make corn muffins because I thought they were gluten free (I checked, and they in fact are not, but I didn’t realize that until after I bought the mix). I also wanted to make the muffins snazzy. 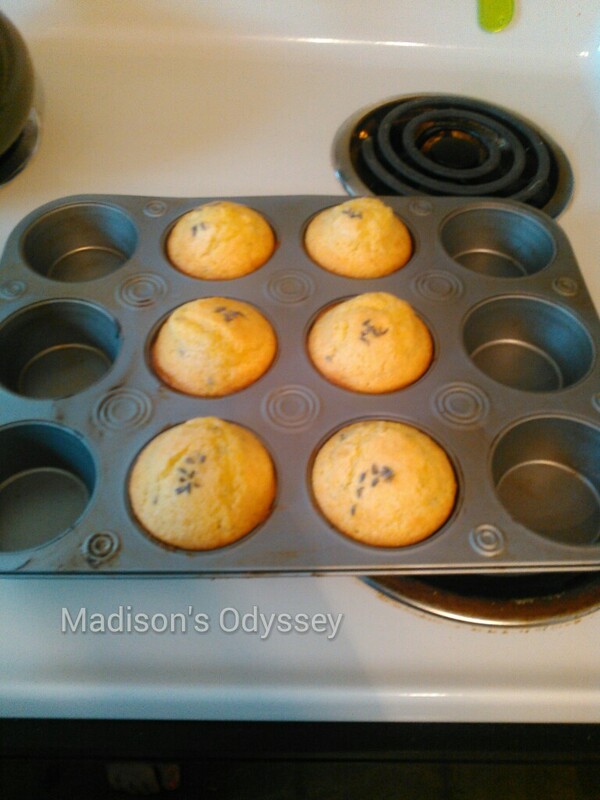 I came up with Lavender Honey Muffins. There are recipes out there for them, but I decided to just make my own. 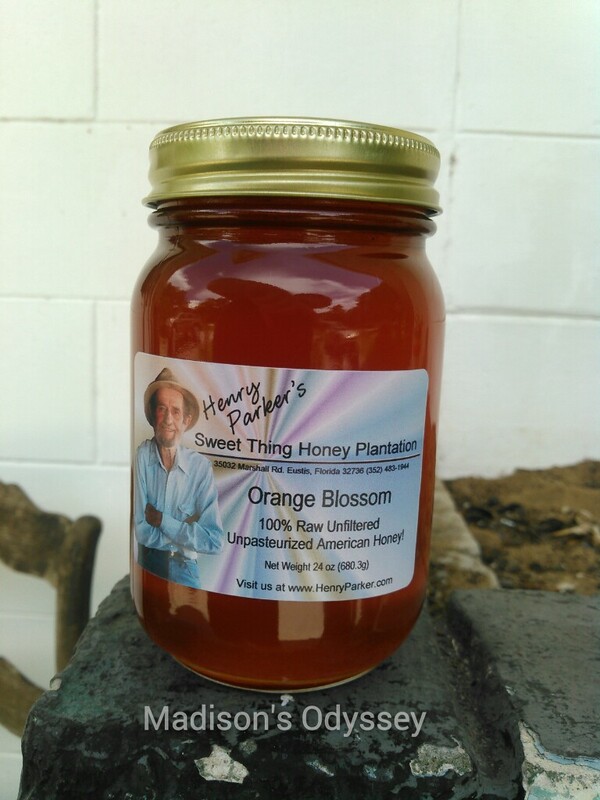 First I had to go to the flea market to buy some local honey. I don’t like using that stuff from the grocery store. After wandering around the flea market for awhile, I finally found the honey guy. They are a family business. His dad started out and we passed away, the son and his wife took over. After I got the honey, I stopped by my favorite witchy shop, The Muse, and bought some new stones. From front to back; Onyx, Goldstone, & Garnet. Onyx: root chakra, assists with challenges in life, protection, & grounding. 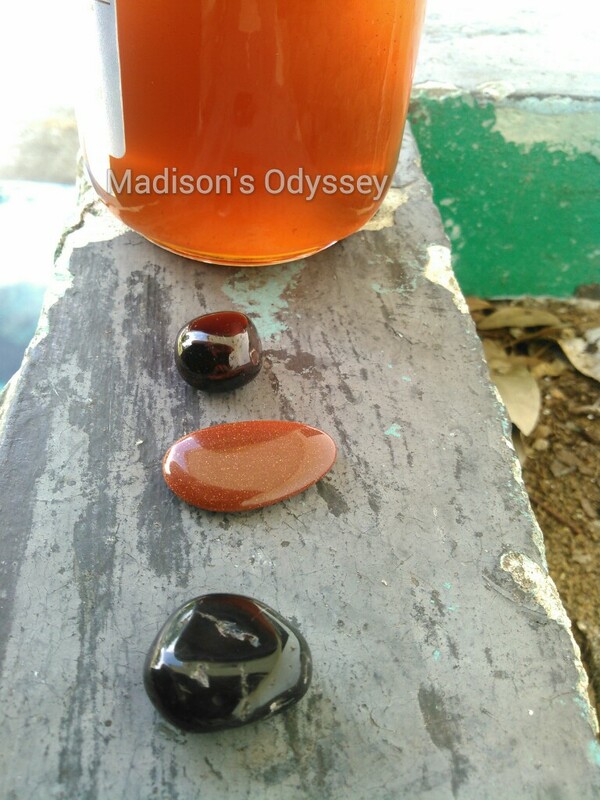 Goldstone: calmness, emotional stability, energy generator, & deflects negative energy. Garnet: regeneration, vitality, order, energizing. Thought these would help with my new moon manifestation. 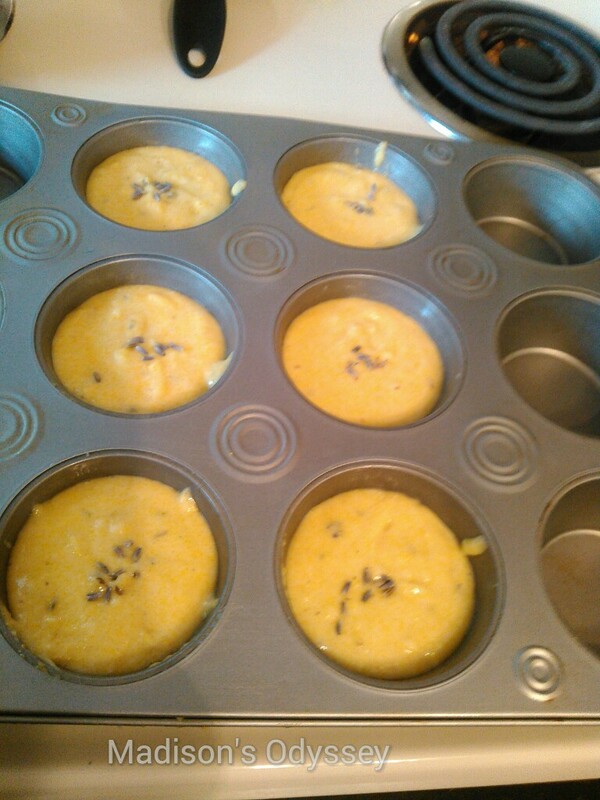 When I got home I started on a practice batch of lavender honey corn muffins. 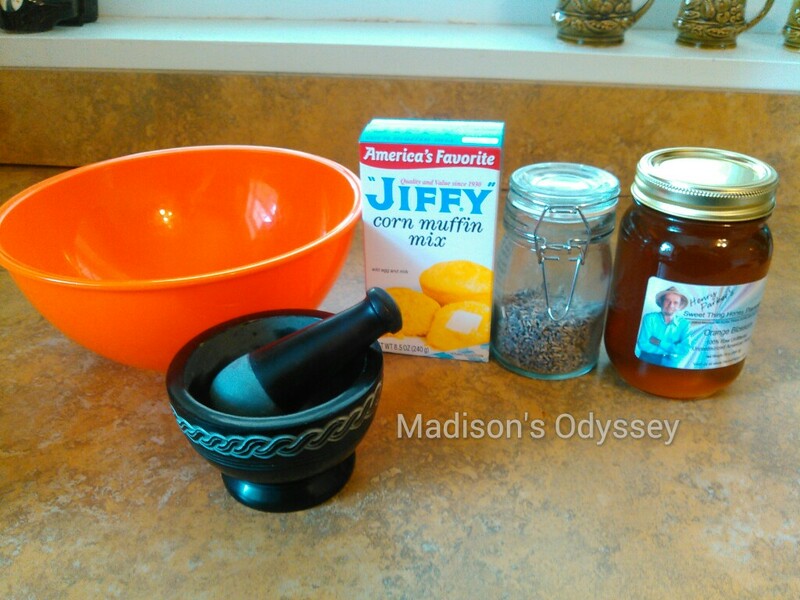 I used Jiffy mix because I had never made cornbread from scratch, plus ain’t nobody got time for that. The directions are on the back of the box. Pretty simple, just added an egg and 1/3 cup of almond milk. I also added 1/2 a tsp of crushed lavender and 2 tsp of honey. 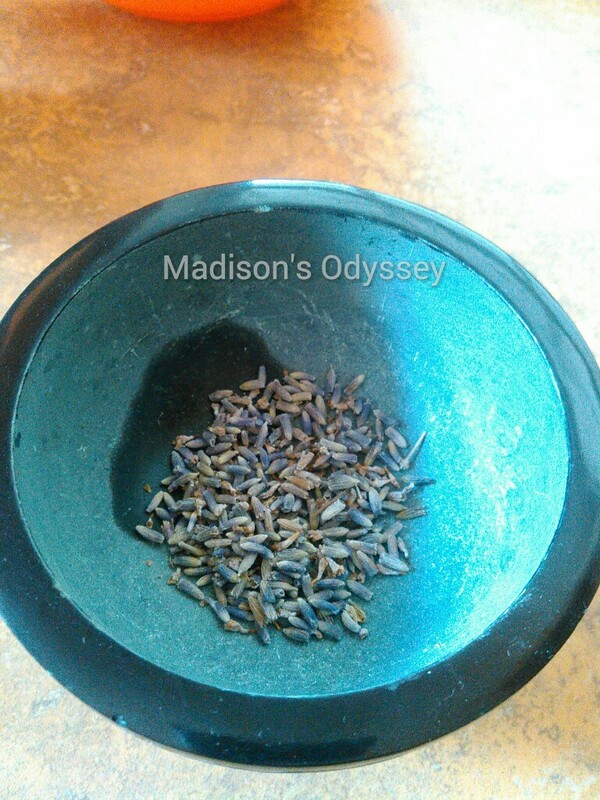 I used my mortar and pestle to crush the lavender, but you could also use the back of a spoon. Before I put the muffins in the oven, I thought I’d add some extra flare. Yeah bad idea. Turns out there is such a thing as too much lavender. Baked the for ten minutes and they were golden. I didn’t get a chance to take a picture muffins because I was running late, but they tasted better than practice muffins. I had an hour drive to get to the ritual. I kind of didn’t want to go because I hadn’t been feeling good and it was raining. I decided to go ahead and go because I wanted to be social and I figured maybe it wasn’t raining in Orlando. It was. It was pouring on my drive over. I almost turned around, but I had already gotten closer to the ritual than home. When I got there, they wanted to have the ritual inside because it was still lightening. So there were a lot of people crammed into a small living room. There was incense burning and I quickly got a headache. I was trying to stay positive, but I was already in a bad mood. Then I got stuck sitting next to this kid that wouldn’t be quiet. When the ritual started, the lady putting it on stood in the same spot, which was right in front of my view of the altar so I couldn’t see anything she was doing. Plus it was hot and stuffy because they turned the fans off so they could light candles. After the ritual, it was the feast. It looked good, but I couldn’t eat most of it because of my gluten allergy. So I basically just had salad. After that, I was regrettably in a bad mood. I decide just to leave early. When I got home, I hung out with my sister and watched YouTube videos. That put me in a better mood. After that I worked on my new moon manifestations. In the center is a sigil I made to take care of my body/health. I used the phrase: “I will make my body healthy”. On the left is the Ken rune which is the rune of the fierce warrior (among other things). I chose this one because part of getting my body healthy is getting my thyroid healthy. I’m already working on that by cutting gluten and taking my medications. I also want to cut sugar and processed foods all together. The symbol on the right is the Ogham – Druir which is the sign of the oak; pare and stability. The blue butterfly is the symbol for Graves disease. 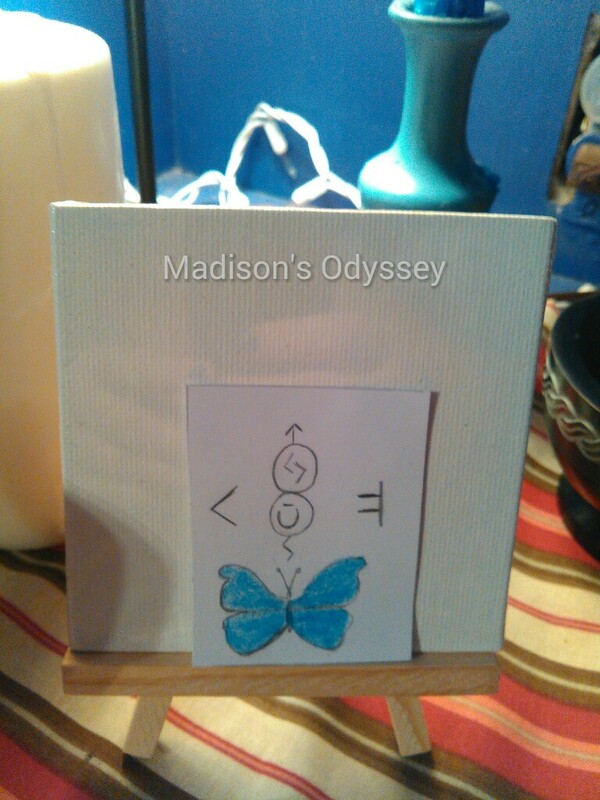 When I finished the card, I put it on the mini easel that I had put on my altar for Lughnasadh. I’ll have to post my Lughnasadh altar later. After I set my card on my altar I went to bed after a long day. P.s. Sorry for all the blurry pictures, I took them on my phone. What did you do for the new moon? What are some of goals you want to work on this month?